I'm writing this for myself as much as I'm writing this for you. Think you didn't get done, or didn't accomplish, or didn't make, or didn't have, or didn't overcome -- fill in the blank, this year? Don't give up. Time is just time. And all things are possible outside of time. For me, the end of year always culminates in me wondering what I wrote, if anything and did I have any of these writing published? Of course, being published doesn't equal success ... and yet, sometimes it does. There's a ton of writing I do that no one will ever see. Not just because I didn't send it out into the world, but because no one wants it. Yep. It isn't the right fit (or it really isn't any good) and I have to keep looking for the right home for the piece. I'm always, always reminding myself I'm in the rejection business. Because it gets old, this whole rejection thing. Yet, if you know it's part of the job, it's manageable. 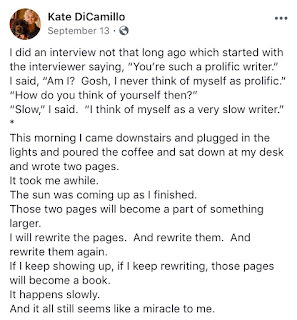 That's what writing, and publishing, is about. A tough exoskeleton is critical for survival. If I'm never published again, that needs to be okay. What isn't okay is if I don't try and don't go for what I want. True failure is not doing something about my desires -- even if they're small. I love the passage below, written by one of my favorite authors. 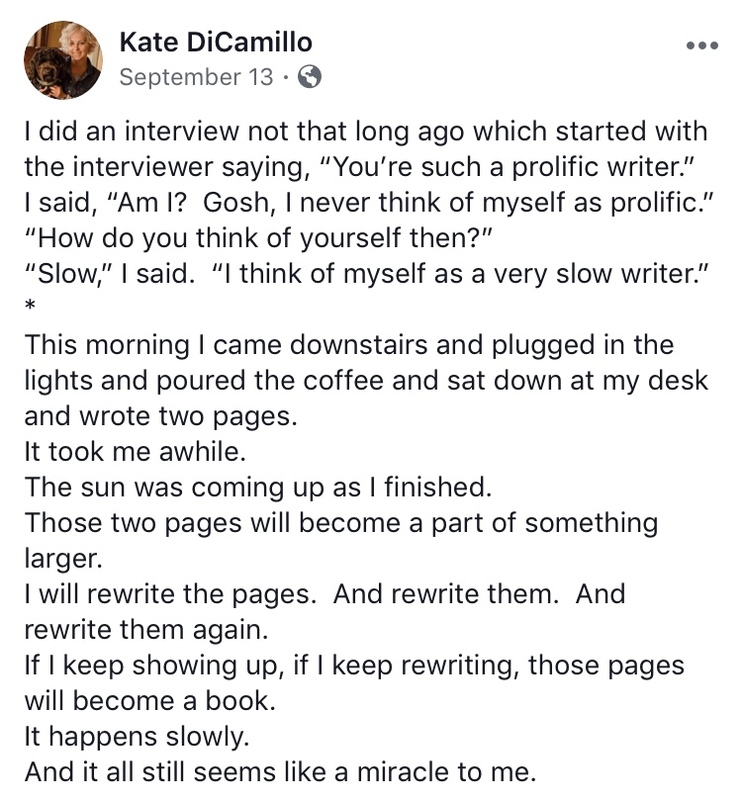 Kate DiCamillo is basically where it's at when it comes to being published and an award-winning writer. But by golly, she knows how to write. And she didn't give up. And this is why she is who she is. This was on her Facebook page months ago and I took a screenshot of it. Because, if she's saying it, then I need to believe it, too. Read and apply. Read and apply. Little by little, we can accomplish what we set out to do, even if it's years later, or even if we don't see it when we want to see it. Even if it hasn't happened yet, doesn't mean it won't. All we have to do is keep showing up and watch the miracle unfold. Namely, finding the small -- very inconsequential -- things of life and not only making them an intentional part of your life, but making them a gift. These gifts are everywhere -- if we're willing to look past our own negative expectations. 1. Expansion: It didn't just stop with pennies, it became dimes and nickels and quarters. And then it became dollars. And then jewelry and keys! There were more gifts around than I thought. I began to find dollars and five dollar bills in the vintage clothing I sold at my Etsy shop. It became comical. My oldest would walk to his car after school and pick up dollars on the ground in front of his car, as if they were left there for him. 2. Everyone: This became more than just about me. I incited my two boys to jump in on this little "game." I explained why I was doing this, that these little gifts from God were reminders that he cares, and reminders to trust Him (In God we Trust). And that we should watch for them. Fast forward to today, they're in on this more than me! 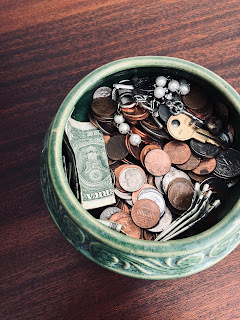 My oldest comes home and tells me the change he found, my youngest throws in metal buttons and keys and quarters (He's really a crow. No. I'm serious. He loves shiny objects and keeps them. All. ) They are just as excited when they find a simple penny as I am. It's amazing in the day and age of video games and early maturing, that this little game has become a fun and memorable daily highlight of my boys'. 3. (Great) Expectations: When you want more, learn to expect more. This is how faith works. There are some days I don't find a penny and I'm actually sad, as if I missed out on something great. These simple pennies almost become like gold on the ground. 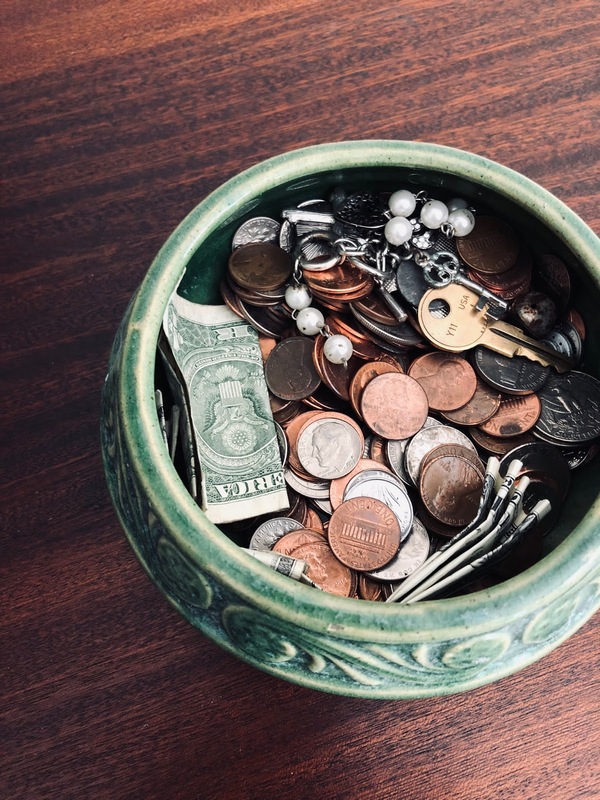 A found penny can sometimes be the single greatest thing that happens on a day of missed appointments, or bad grades from the kids, or disappointment in relationships. It's that constant reminder that God is still there. And that he's still giving me good things when the world is crashing down around me. Try it. I dare you. You make think I'm crazy now. But once you're looking and finding them, you'll see what I'm talking about. You'll see the gift in the simple that no one else even cares to look at. It's like complimenting someone when you don't feel like it. Or picking up that extra gift of favorite dessert for someone you love. It all counts. Every gift, every word, every small gesture. And every penny counts, too. As a gift to yourself. How can you possibly say no to that? Like many of you, I am a list-maker. I find them to be one of the most rewarding things I can do in my little life. Well, that and drinking coffee and wearing vintage. But, I digress. List-making really only consists of three things: paper, a pen, and your brain. While there are myriad articles and books on tidying up and minimal living (both of which I fully embrace), living a simple and minimal life can also start just by making a list. So, why should you write a list? Three reasons: it's simple, it's in front of you, and anyone can be master of their world with one. Yes, dare I say master of your universe. Pretty amazing, right? That little list holds your sanity, order and clarity. And those are all we really need. 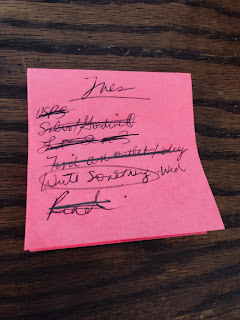 Check out this list I wrote the other day: I listed the errands I had to run (go to post office, then to Salvation Army and Goodwill to find my vintage to sell). I listed the work I had to do (list two items items for sale on my vintage Etsy site, and find an outlet -- meaning a writing outlet, as in a journal or magazine I want to submit to). And of course, read. I have to read. I get to read! I've made other lists before with laundry or cleaning the kitchen as part of it. This may seem silly. But when they're on that list, I do them. And getting them done means scratching them off the list. And if I don't do anything else other than the to-do items on the list, I feel accomplished. I feel like I got somewhere, like things are under control. Writing is a big one I try to do every day. If I'm not being creative, I don't feel like I'm doing what I was created to do. Even if it's small, like a journal entry, or blog post, or a poem, that counts! That makes me a writer. Side note: I'd like to say to putting the list on your phone is not helpful. I've done this before and it may work for some folks, but it doesn't work for me. 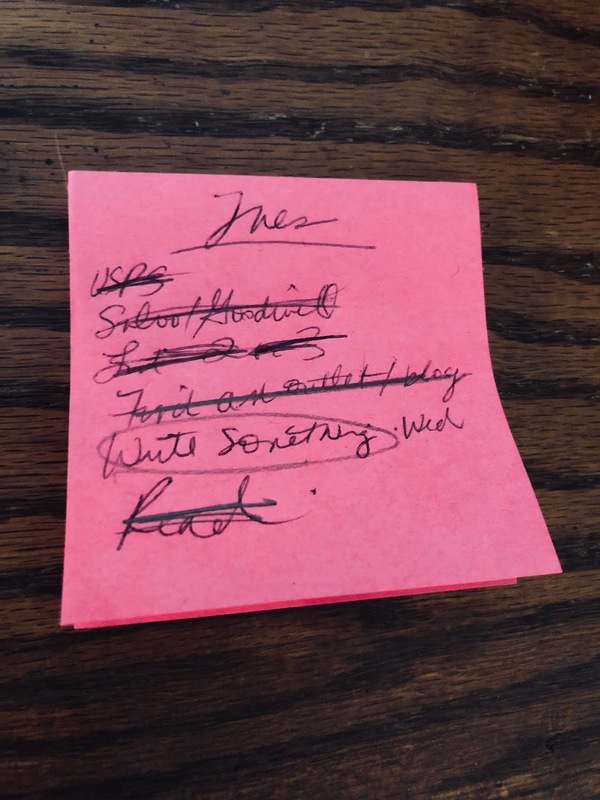 I need the list visible; I need it on a sticky-note so I can take it with me wherever I want. And I need to literally cross it off that list to be master of my universe. Make that list. Get stuff done, people. If it's cleaning out the fridge, or teaching your class you teach every day, or picking up the dry cleaning, put it on the list, do it, and check it off. Honestly, some of that list will make you feel accomplished just for being alive and other things on that list will get done because you'll feel accountable to it. This is a major victory. This is organization. So, three things: paper, pen, and your brain. Get that party going, write a list every day (or every night for the next day -- which I prefer to do) and watch your little world be all that it can be.